Vinyasa Flow Join me for a heart soaring flowing yoga sequence. We use the breath through the poses to help detoxify organs and relieve stress whilst improving flexibility, stamina and muscle tone. Finishing with a deep relaxation to help you soak up the benefits of the practice. “Hayley’s classes are just the right mix of relaxing, revitalising and dynamic. 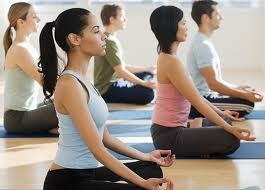 I have tried lots of yoga classes over the years and really love the way Hayley’s classes are planned and executed. You feel like you are pushed just the right amount with an interesting variety of poses and she really encourages and supports students of all levels. Is the class at Emerson’s green suitable for beginners?